Quin'rawl Burglar is a legendary Agility creature card. It is part of the Core Set. "Khajiit will find a way in." "This one is very... resourceful." "Fine! 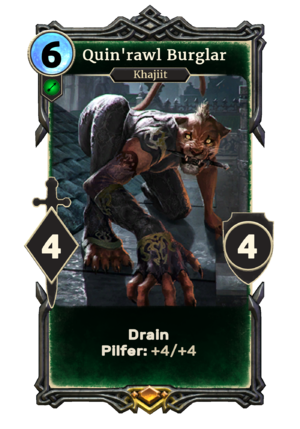 Khajiit will go through you!" "Do not stand in this one's way!" This card was previously part of the training mechanic where it could be upgraded from Quin'rawl Skulker at level 10. This card's pilfer ability applies the Perfect Touch card effect. This page was last modified on 25 February 2019, at 01:25.